A mascot on the mental brink after a spell in the washing machine… – The Diesel-Electric Elephant Company. It was for his own good. He needed a bath. He had six minutes in the twin-tub, six on rinse and six minutes in the spinner. Now all he does is tremble, mutter about “bad hair forever” and stare at me with those accusing eyes. You’d think that I’d tried to drown him or something. Progress abounding on the Cardinal. Flooring is going down. Insulation first, a layer of foil and then some nice oak which is what I gots me at a very goodly bargain price. Of course, nowt is square or parallel on a narrowboat, so each piece must be cut to a slightly different length and shape. It feels great underfoot, and looks a treat. The shower-room is all but finished (still the soft, sensuous, black rubber flooring to go down sometime, ooh, er, missus). A flick of the light-switch now turns on the red night-vision LEDs, a second flick changes them to bright white. The shower itself now bathes in a neon blue glow, which makes taking a shower just that little bit “Star Trek”. The red night-vision gizmo means that I really, really don’t have to be fully awake to visit the necessary offices during the night – luxury, eh? I was going to take a selfie while I was in the shower to show you the lighting effect, but then I realised that you’d all end up looking as though you’d just spent six minutes in the washing machine… so I didn’t. Be grateful. The washing machine’s home is now finished and trimmed. It stows out of the way in the galley, with an extra worktop as a bonus. Just awaits the velvet restraining rope to the front so that it doesn’t move out of place as we cross the Atlantic or something. All of the earlier work that is now unseen, the wiring, the changes to the layout, all feel as though they are coming together, and the end is in sight. It’s either that, or there’s a train heading towards me in the tunnel. Galley gets more attention next, with cupboard doors being removed and re-trimmed so that the shelves are open-plan basket cases (wibble moo fribble de-clomp, Nanny…) and mayhap a change to the main worktop surface. Ancient refrigerator will be leaving me for pastures new, to be replaced by two separate 12v coolboxes. Panels are going up over the … traditional… carvings that currently adorn the various stem, stern and side doors. The furniture on these is being simplified, with better bolts, better locks and “medieval” style locking bars that just drop into place. Simples is the way to go, methinks – it suits my brain. Aside from that, it’s been a relaxing week. Today, by way of cont-er-ast, has been an unseasonally summerish festival of waking up when I felt like it, coffee, toast – and of emptying “Thunderbird Two”, filling the Cardinal’s water tank, a couple of hours of laundry and some writing of this blog post. Domesticus abounding. Later I may iron a shirt or six, and arrange my boxer-shorts into colour order with a sub-order of gusset-itchiness. I’ll tackle rolling the socks tomorrow (that’s a job I find best on Sundays, when I know that lots of religious folk are probably praying). Socks are dangerous things. Right now though the ripples on the water are slapping at the Cardinal’s bow, the sun is shining and I am contemplating (vegan) cherry pie and (vegan) custard for tiffin, just as a restorative, to keep my vitaminous levels and suchlike up. One mustn’t allow one’s various sanguine, choleric, melancholic and phlegmatic humours to drop, must one? All suggestions as to how to calm the mascot down and bring him back from the verge gratefully received. Next The Society for the Movement of “Up” to a More Convenient Location – S.M.U.M.C.L. 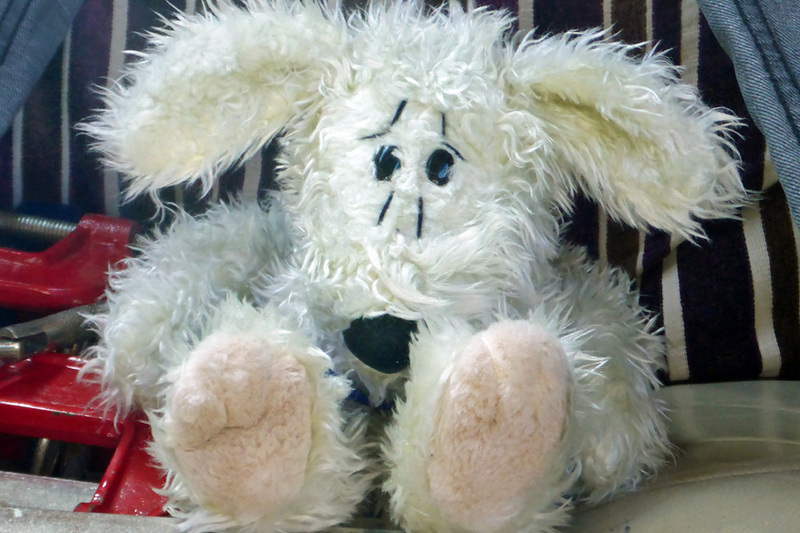 I think your poor mascot needs a squeezy cuddle and a nice cup of tea! 😉 The coloured lights are very impressive, boat coming along nicely. Is there a crime of ‘abuse to mascots’? At least punishable by a flogging – poor squinty eyed beastie (is it meant to be a wabbit?) It looks like a Yetti wot has shrunked. I colour co-ordinate under garments into black, black and black. Socks? No. In that immortal line of Paul D Brazill: he suffered vertigo so badly he couldn’t even wear thick socks. Regards the (much put upon looking) mascot – are you to be trusted with a comb or soft bristled brush Ian? I think I’d been mortally bitten until dead should I even approach at the moment, brush in hand or otherwise! A quick fluff-up later may be in order. You’re not wrong about winter, in a couple of weeks or so I shall have to remember where I’ve hidden my thick socks and gloves – and my beanie hat for sleeping in. 😉 AND I MUST remember to sweep the stove chimney too before it complains! Hey Sooty had his own narrowboat – Well Matthew Corbett did anyways. He wasn’t allowed to call it Sooty though! !